When I was 12 and going to stores to buy beads, it was difficult for me to go find non-plastic beads in places other than stores dedicated to selling craft supplies. But since then, the interest in making jewellery has grown and many other people make jewellery too. Craft departments in department stores have some pretty good selections for seed beads. General crafts stores (like Michaels) do carry decent bead selections. I also like to check out the clearance sections – I’ve bought strands of glass beads marked down from $10 to $1.50. Good deals can be found, if you’re willing to search for them as well as using coupons (they can come in weekly fliers or online). Some of my favourite beads have been found at craft stores, especially after my local chain craft store was given a makeover. 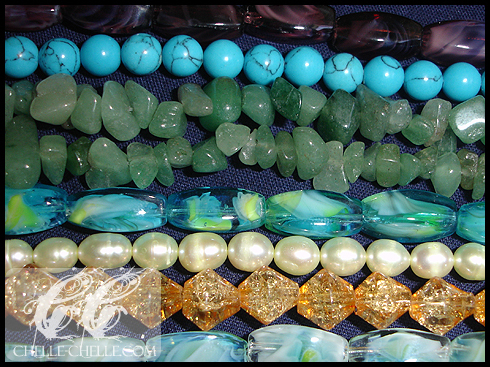 Now I purchase freshwater pearls and turquoise beads when they come up on sale. I never pay full price on the beads that I buy at the craft store, never. I even bought my pliers with 40% off coupons at the same store. It’s a great resource and there’s no excuse to be paying full price at chain craft stores. A decent source, I’ve found, for seed beads. Some dollar stores also carry some scrapbooking supplies (if you’re into that sort of thing), as well as glass beads (however, I’ve found that they are generally more expensive at a dollar store than at crafts stores), some stringing material (fishing line – which I do not recommend, some wire) and metal charms. I mostly recommend shopping at dollar stores for seed beads – the vials are about the same size as the ones found in crafts stores and you can find glass seed beads. However, they will not have the same quality as Czech glass or Delicas, so they’re probably not the best for doing bead looming, but for other uses they work quite well. Seed beads are one of my favourite things. They do come in different sizes and they can be just the right thing to have in a piece if your focal beads are fairly large. Consider making a bead spinner if you plan on stringing (not looming!) a lot of seed beads. Most thrift stores will have a jewellery section and you can generally find some nice pieces. I’ve bought very ornate earrings with quality metal charms for the purpose of reconstructing, as well as long necklaces for the purpose of using the beads. I have never paid over $3 for a piece of jewellery at a thrift store and I like the things that I can find there. Some things include a long necklace with all glass beads and a beautiful clasp ($2) and a bag of earrings where some were singles – I reconstructed them for pendants for necklaces or connecting them together to make bracelets. I like using plastic boxes to store my beads. I originally started out using film canisters (back when film cameras were used and when I didn’t have a lot of beads) and then graduated to using small plastic containers that were recycled. I eventually ended up getting small plastic containers for the sole purpose of holding onto my beads. You can use medication boxes (you can find them in dollar stores, pharmacies, etc. ), I’ve also seen photos of people using tackle boxes for storing beads as well as screw-top plastic or glass containers. I’m a huge fan of using clear boxes – it makes it easier to know exactly what is in a container with just one look. When I first started beading, my parents bought me a plastic case full of plastic beads to get me started. It had a whole ten pounds of plastic beads which I painstakingly organized before I started to use them. You can find little beading kits nearly anywhere now – at craft stores, in department stores (sometimes in craft departments, sometimes in toy departments, in dollar stores. The great thing about beading kits is that they come with a nice selection of beads (generally in the same colour group), some basic instructions (good for beginners), as well as findings for making the projects that they have in mind. 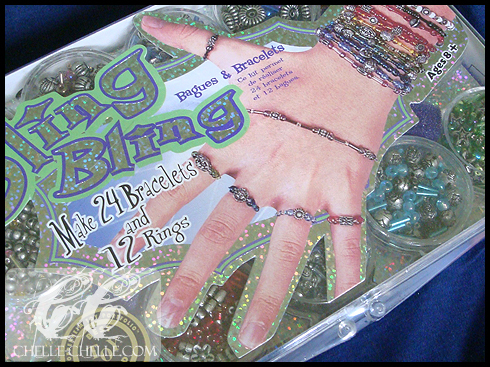 These can include jump rings, clasps, earring hooks and some form of stringing material. I do buy these from time to time – I find them on sale and purchase them for the contents to use in my pieces. I do substitute, sometimes, the stringing material but I like how once you’re done using the beads in the kit, you can use it to store other beads. These can be fairly good deals – especially if you’re buying one on sale or with the use of a coupon. Some of my favourite pieces came from beads that were from beading kits. I would test the metal components that come with your beading kit though. I’ve purchased one that had some beautiful beads, but all of the metal components (earring hooks, clasps) rusted soon after the pieces were completed and had to be replaced.